Dr. Chinnaiyan’s research is focused on functional genomic, proteomic and bioinformatics approaches to study cancer for the purposes of understanding cancer biology as well as to discover clinical biomarkers. His group has characterized a number of biomarkers of prostate cancer including AMACR, EZH2, hepsin and sarcosine. AMACR is being used clinically across the country in the assessment of cancer in prostate needle biopsies. 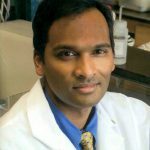 The landmark study from Dr. Chinnaiyan’s lab thus far is the discovery of TMPRSS2-ETS gene fusions in prostate cancer. TMPRSS2-ETS gene fusions are specific markers of prostate cancer as well as presumably function as rational targets for this disease. This finding potentially redefines the molecular basis of prostate cancer as well as other common epithelial cancers. Currently efforts are underway to target this gene fusion as well as discover similar gene fusions in other common epithelial tumors such as those derived from the breast, lung, and colon. The group has also developed the popular cancer profiling bioinformatics resource called Oncomine (www.oncomine.org) that is freely available to the academic community (hosting nearly 10,000 registered users from over 30 countries).